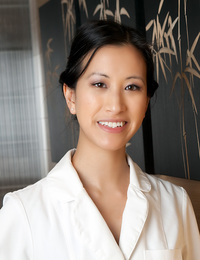 Claudia is a Registered Acupuncturist who is dedicated in working with her patients to obtain their health goals. Trained at PCU College of Holistic Medicine, with a Bachelors degree from the University of British Columbia, she is an avid educator in health and wellness and has held numerous lectures around the community and at corporate workplaces. Though she has treated a wide variety of ailments and health concerns, Claudia has a special focus in treating pain conditions such as chronic back pain, migraines, fibromyalgia, sports injuries, joint pain, frozen shoulder, and sciatica. Claudia utilizes different modalities along with acupuncture, including fire cupping and biopuncture, to effectively manage and treat chronic and acute pain. She holds certification in Injection Therapy, so can administer vitamin injections and trigger point pain injections. Claudia has advanced training in cosmetic acupuncture, which is a safe and natural way to lift sagging skin, soften fine lines and wrinkles, and improve skin quality. She has also been trained in Chinese face diagnosis, skin micro-needling, and facial aesthetics, making her the go-to acupuncturist to tackle anti-aging concerns. Begin your healing today, book your Initial Session with Claudia here.